Prepare the potatoes by scrubbing well to remove dirt and loose skin. Place in a saucepan and cover with the minimum amount of boiling water. Place a lid on top and simmer gently for approximately 20 minutes until just tender. Drain and allow to cool slightly. Meanwhile place the tomatoes, baby spinach and pine kernels into a bowl. Place all the dressing ingredients into a screw-topped jar, shake well and pour over the warm potatoes. Add the potatoes with any remaining dressing to the salad ingredients in the bowl. 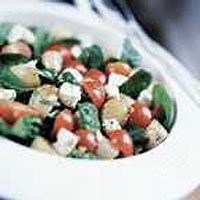 Drain any excess oil from the feta cheese and cut into small chunks. Add to the salad, toss and serve immediately.